Sunday, May 21, 2017 – New York, NY – More than 300 homeless dogs, cats, and rabbits found their forever homes on Sunday afternoon at Adoptapalooza, New York City’s original mega pet adoption event, taking place in the North Plaza of Union Square Park in Manhattan. Hosted by the Mayor’s Alliance for NYC’s Animals (the Alliance), and presented in partnership with the Petco Foundation, this event offered fun for the whole family while shining a spotlight on the critical importance of animal adoption. 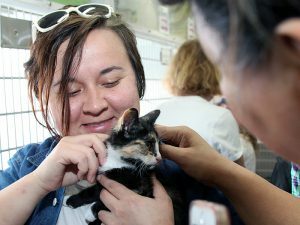 The pets looking for new families at Adoptapalooza — all spayed/neutered and vaccinated — were presented for adoption by dozens of Alliance Participating Organizations including local shelters and rescue groups. Since it was founded in 2003, the Alliance has worked to save the lives of New York City’s homeless pets. Over the past 14 years, this coalition, which synergizes the efforts of approximately 150 participating animal shelters and rescue groups, has saved more than 300,000 animals. Prior to 2003, only 25% of animals who entered Animal Care Centers of NYC (ACC) left alive. Today, thanks to the Alliance’s programming and the resources it provides in tandem with the lifesaving efforts of its participating organizations, the City of New York now boasts a 90% community-wide live release rate. Jane Hoffman, Alliance President, said, “Adoptapalooza gives us a chance to showcase our wonderful four-legged neighbors who are in dire need of a loving forever home. It’s so important for the whole family to be involved in bringing a special pet into the home and today, Adoptapalooza gives them that chance! 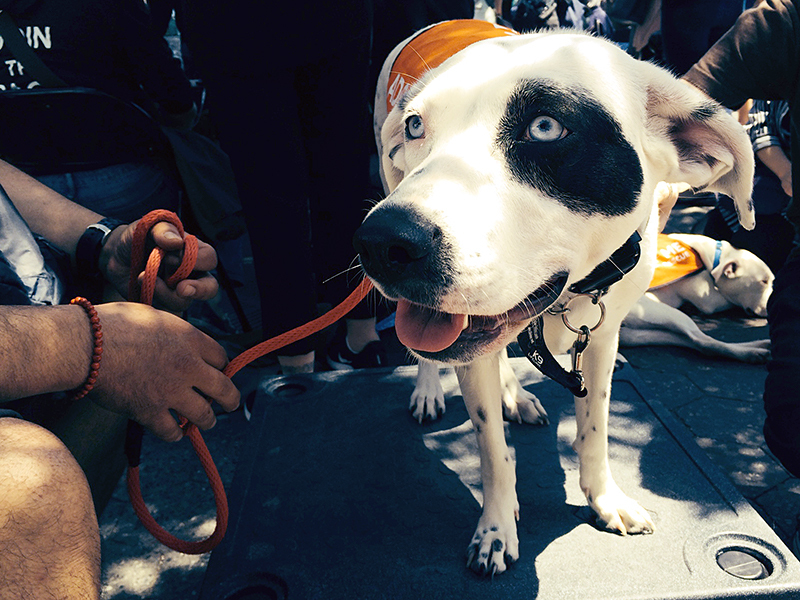 “Just as important, events like Adoptapalooza are critical to our efforts to raise public awareness about the plight of homeless animals in New York City and our efforts to maintain our 90% community-wide live release rate,” Hoffman added. Adoptapalooza co-sponsor, the Petco Foundation, presented the Mayor’s Alliance for NYC’s Animals with a check for $200,000 to support our life-saving animal rescue initiatives in New York City this year. 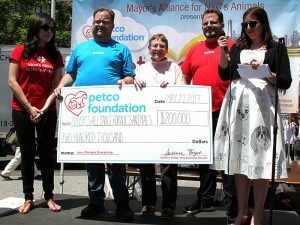 (Photo by Rick Edwards)[/caption]The Petco Foundation, a strong Alliance ally, presented a check for $200,000 to Hoffman to support life-saving Alliance programs like Wheels of Hope, the NYC Feral Cat Initiative, and mega pet adoption events like Adoptapalooza. In addition to pet adoptions, Adoptapalooza featured: tricks and training tips from a certified Petco trainer on the dog training field; face painting and fun temporary tattoos for kids; dog licensing by the NYC Department of Health; free (for the first 50) and low-cost ($15) microchips for dogs and cats by Vetco; emergency preparedness information from Ready New York/NYC Emergency Management; free pet photos and pet ID tags; and giveaways from event sponsors. Rock & Rawhide, a non-profit organization that distributes donated supplies to shelters and rescue groups, collected clean blankets, towels, and pet toys for shelter animals.